The many flaws in the Senate's rollback of Dodd-Frank: Attention must be paid. A couple of days ago, I participated in the "On Point" radio show about this (sort of) bispartisan effort to significantly rollback the Dodd-Frank financial reform bill that passed back in 2010. I was a member of team Obama back then and thought this was an important and very necessary advance. Imperfect, sure, but an essential set of regulations and consumer protections to diminish the seemingly endless repetition of the economic shampoo cycle: bubble, bust, repeat. You can listen to my take on the show. I think this so-called fix to the bill goes way too far and exempts or partially exempts too many potentially risky institutions from the necessary oversight in Dodd-Frank. This mistake represents a) precisely the amnesia about reckless finance that repeatedly shows up years after the last crisis, b) an underestimate by the Senate Democrats signing on to the measure of the risk brought back into the system , and c) an almost completely unnecessary bit of work. By that last point, I mean this: what's the motivation here? The financial sector, large and small, is doing great in terms of profitability (and that's before all their goodies in the tax cuts), credit is freely flowing, and while there's always speculation afoot in financial markets, there are no large and potentially destabilizing credit bubbles. So, of all the problems we face, why should Congress waste valuable time fixing something that's clearly not broken? No question, as I stressed on the show, compliance with Dodd-Frank is far from costless, as any banking executive will readily tell you. And while the compliance burden is smaller for smaller banks, it's still a pain for some institutions, like community banks and credit unions. So, I grant that there's a rationale for reducing that burden. But, as you'd expect, given the linkages between Congress and the deep-pocketed banking lobby (and, trust me, I'm not just talking about the R's), the Senate legislation goes much further than that. Moreover, once the bill gets out of the Senate, it may well have to be reconciled with a far more deregulatory House bill. Most notably, the Senate bill leaves the Consumer Financial Protection Bureau created by Dodd-Frank intact, whereas House conservatives have long been trying to crush the CFPB. But there were two points that came up in the show that I wanted to further amplify, including an important fact check. A couple of times in the show, advocates of the rollback argued that Dodd-Frank was responsible for putting a bunch of smaller banks out of business. 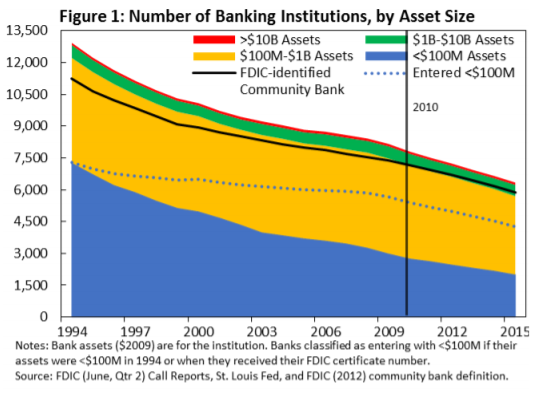 I pointed out that while it's true that there are fewer smaller banks, this is a long-term trend that did not accelerate post Dodd-Frank. The figure below shows this to be the case, which correct the strong, wrong assertion to the contrary made by Cong. Jeb Henserling towards the end of the show. My second point is one I alluded to but wanted to further underscore: just because a bank is not "systemically connected," i.e., its failure does not threaten the larger financial system, doesn't mean it should be able to engage in excessively risky finance. The rollback allows smaller banks to make some of the same kind of risky mortgages that inflated the bubble that ultimately gave us the Great Recession. For two reasons, however, proponents of the bill argue this won't be a problem. First, because the banks can't securitize and offload the mortgages, so keeping them on their books gives them the incentive to not underprice risk. Second, they simply don't lend enough in this space to threaten the system. I don't buy the first claim for a moment. The reason the shampoo cycle exists is because time-and-again, institutions increasingly get their risk on as the memory of the last meltdown fades. We had plenty of credit bubbles and busts before securitization come on this scene. I asked the Roosevelt Institute's Mike Konczal (read his excellent, deep-dive oped on the rollback bill) about this second point: whether we should downplay concerns about smaller banks because they're not "systemically connected." Like me, he views such concerns as highly germane to this misguided legislation: "When banks fail, they usually fail in a correlated way, because they are chasing the same strategies and ideas. So, you can have several mid-sized or smaller banks collapse at the same time and added together they become a real threat. At that point you'll wish they were better capitalized and had better failure planning, which is exactly what this bill rolls back." This is far from over, and I can tell you from my own visits up to the Hill in recent days that many Democrats, and not just from the Sanders/Warren wing, recognize what's going on here, oppose the bill, and fear their Senate colleagues got rolled. So, assuming you'd rather not end up where we were ten years ago, stay tuned into this and join me in pushing back on it.